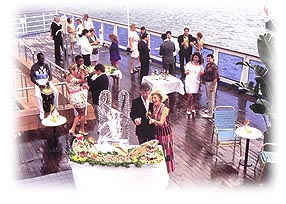 Weddings on a cruise ship, Discovery Cruises destination weddings. and Dale Cohen for the Wedding Plans. South Florida is a great place and one of the many things that makes it even greater is our proximity to many different islands. So if you're planning a meeting, an incentive group or special event you will want to consider a Discovery Day Cruise to Grand Bahama or an optional Cruise 'N Stay Vacation to the island. Make your meeting more memorable with Discovery. We offer award-winning meals, spacious sun decks and swimming pool, limbo contests, games and all kinds of fun, all to the beat of great island music. You will also enjoy our Las Vegas Style Casino, slot machines, showrooms and disco. It's a great day and night out at sea. Your cruise departs at 8:00 AM and returns at 10:45 PM Monday - Saturday and 9:45pm Sundays. You will have just enough time on the island to do some shopping, snorkel or take a tour. Your wedding day is one of the most important days of your life. It symbolizes a new beginning. It should be exactly what you want it to be. And a wonderful celebration with memories that will last a lifetime. Discovery Cruise Line offers both weddings at sea and exciting weddings at a variety of locations on Grand Bahama Island. We have teamed up with a certified wedding specialist on the island to provide you with the utmost of service from ship to shore. And the best part of your Discovery wedding is that you will enjoy your celebration the moment you board. Your trip to and from the island will be a fun and exciting part of your destination wedding. The flexibility and choices Discovery offers will allow you to make your wedding exactly what you want it to be. Our partnership with "A Social Affair's" Mary Saunders-McBride will insure that you will have a top notch specialist coordinating your entire event. Now you and your entire wedding party can enjoy traveling to your destination on Discovery Cruise Line. Discovery offers daily service from South Florida to Grand Bahama. You depart at 8 AM and arrive around 1 PM. You will enjoy both a lavish buffet breakfast and lunch on your journey. And, of course, we are able to offer you other options on board. You can choose to marry at sea or you may just want to enjoy a special day preparing for your wedding on-island. The cruise line provides a full array of entertainment and activities as a longer cruise, all packed into one fun-filled day. Whether its a private and pristine beach or a lush tropical paradise, Grand Bahama has it all. There are so many beautiful places on the island it would be impossible to list them all, but here's a few of our favorite recommendations: Choose one of six beautiful beach locations depending on the surroundings and proximity of what you want. You will find the choices of beaches to be abundant and diversified. Or, you may choose to be surrounded by nature. If that's the case, you can choose Garden of the Groves, The Rand Nature Centre, The Lucayan National Park, or any number of other beautiful locations. If you're more of a traditionalist, Grand Bahama Island has churches of various denominations on-island. You can also choose the Wedding Chapel (non-demonational) at Garden of the Groves. For those who prefer a hotel or resort, Grand Bahama offers beachfront, marina, and country club resorts. The choices are plentiful and the settings offer everything from island chic to elegant resorts. If you prefer to marry at the Port Lucaya Marina or on a yacht, we can offer that too. As a matter of fact, on Grand Bahama island we can be as exotic as your imagination. You can marry on horseback, jet ski, or underwater in either our submarine or on a scuba dive. After all, it's your dream of a lifetime and we specialize in delivering that dream. We can literally cater to your every needs so simply ask and we will do much more than accommodate you. Discovery can provide your group with tailor made programs that meet your group requirements. We also offer exciting family programs that allow kids to sail free in addition to our spouse programs.